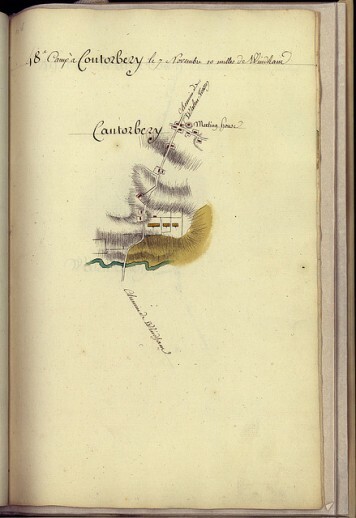 This map, “Camp à Contorbery, le 7 Novembre, 10 milles de Windham,” is a page from the manuscript atlas Amérique Campagne 1782. The volume, one in a series, once belonged to Jean-Baptiste-Donatien de Vimeur, comte de Rochambeau, the commander of the French army in America during the Revolutionary War. France formalized its aid to the colonies following the treaties of 1778, sending military and naval forces to assist the insurgents against Great Britain. Lieutenant General Comte de Rochambeau arrived in Newport, Rhode Island, on July 11, 1780, with 450 officers and 5,300 men and led them to victory at Yorktown, Virginia, 15 months later.